People sit on the steps of Morris Brown AME Church while services are held on Thursday in Charleston, South Carolina. Federal investigators are looking into whether the fatal shooting of nine people at a black church in Charleston, South Carolina, by a white man Wednesday is a hate crime; the city’s police chief has already said it is one. If the shooting is classified as a hate crime, the federal government could prosecute the suspect. South Carolina has a long history of anti-black racism and violence, but it’s hard to say whether hate crimes are more common there than elsewhere. In recent years, the state doesn’t appear to have had an inordinate share of the country’s hate crimes, but that may be because of the limitations of hate-crime statistics and the inconsistency of hate-crime legislation. The Southern Poverty Law Center has compiled 4,121 hate incidents nationwide between January 2003 and May 2015. (The SPLC defines these as “incidents of apparent hate crimes and hate group activities … drawn primarily from media sources.” In addition to assaults and acts of vandalism, the count includes things like rallies held by hate groups as well as legal developments in hate-crime cases.) A little over 1 percent of those, or 47, were in South Carolina. Based on the state’s population in 2009, the middle of the period covered, that works out to 10.3 hate incidents per million people over the 12-year period. The national rate is 13.4 hate incidents per million people. South Carolina’s rate is the 31st highest among the 50 states and the District of Columbia. The latest crime statistics compiled by the Federal Bureau of Investigation paint a similar picture. In 2013, agencies in every state but Hawaii, plus Washington, D.C., reported hate-crime statistics to the FBI’s Uniform Crime Reporting program. South Carolina had 51 reported hate crimes, 33 of them motivated by racial bias. That’s 10.7 hate crimes per million 2013 residents — which was the 34th highest rate among the 49 states and D.C. — and 6.9 motivated by racial bias, which was 33rd highest. There’s a third major source for hate-crime stats: the Bureau of Justice Statistics’ National Crime Victimization Survey. The 2012 survey asked more than 160,000 adults about their experience as crime victims, an enormous sample — yet not big enough to reliably report hate-crime rates by state. Although the survey counted about 300,000 hate crimes in 2012, “it’s still a relatively rare event,” BJS statistician Lynn Langton said in a telephone interview. Hate crimes are rare enough that we can’t compare them across states using survey responses. That also makes it impossible to know whether reporting rates for hate crimes differ by state. 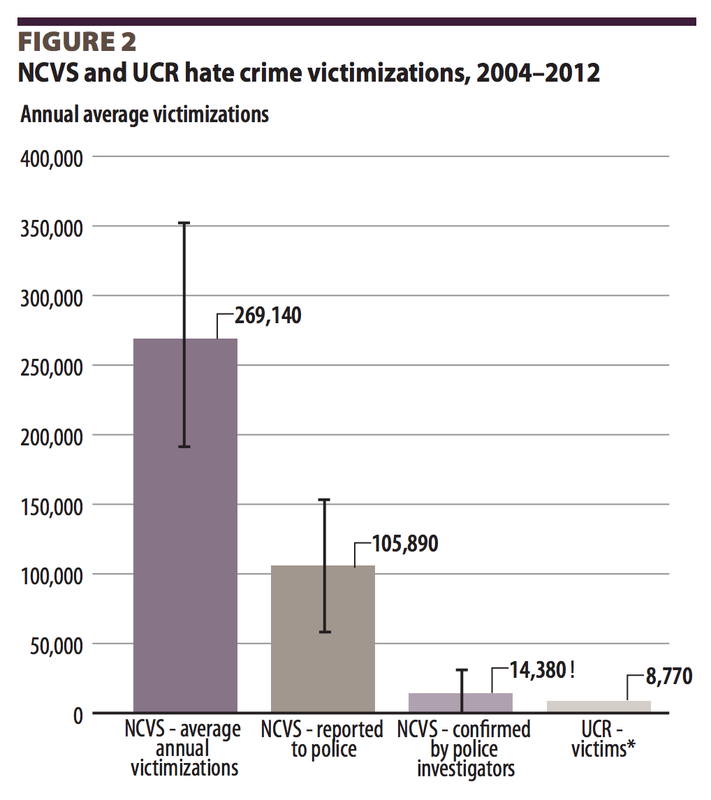 The National Crime Victimization Survey counts far more hate crimes than the FBI’s UCR does, in part because 61 percent of hate crimes that respondents report on the survey haven’t been reported to police. If South Carolinians, for example, are less likely to report hate crimes to police, that might make the state look like it has lower than average hate-crime rates without it being the case. That’s one reason the FBI cautions against using UCR stats to rank states’ crime rates. Here’s one big reason South Carolina residents and law-enforcement agencies might be less likely to report hate crimes than people in other states: Their state has no specific hate-crime legislation on the books. Like all states, South Carolina is covered by federal laws defining hate crimes. But unlike nearly every other state, South Carolina doesn’t specify tougher sentences or widen the group of people who can be victims of hate crimes. There is at least one state law that touches on hate, by requiring at least six months of prison time for damage to a building of worship. CORRECTION (June 18, 7:53 p.m.): An earlier version of this article used incorrect per-state data for rates of hate incidents in the Southern Poverty Law Center database. We’ve corrected the text and table. There is a moderate correlation — r-squared of 0.34 — between SPLC data by state and UCR hate-crime rates by state, and a smaller correlation between SPLC data by state and UCR racially motivated hate-crime rates by state (r-squared of 0.11).